The general trend to focus more on core competencies and the ongoing shift of value creation to suppliers has caused the dependency of purchasing companies on their suppliers to grow (Ellram and Birou 1995; Boutellier and Corsten 2000). Together with this development, more and more cooperative relationships with suppliers have evolved, and as a consequence more single sourcing relationships have emerged: e.g., strategic supplier relationships, strategic partnerships, and strategic alliances. This leads to the fact that the purchasing companies are confronted with new risks involving the risk of supply disruption. These risks are often seen as a risk of single sourcing. Single and multiple sourcing are the more frequently discussed approaches in Supply Risk Management (Khan et al. 2007). However the risk analysis of both these approaches follows stereotypes. Whether single or multiple sourcing reduces the risk, is disputed. Furthermore, one other important fact is often missing: in many cases, there is no opportunity to choose between these two alternatives. The discussion of these two approaches will be developed in the remainder of this chapter, employing a differentiated view of risk to develop the basis for a more contingency-based method for managing the associated risks. 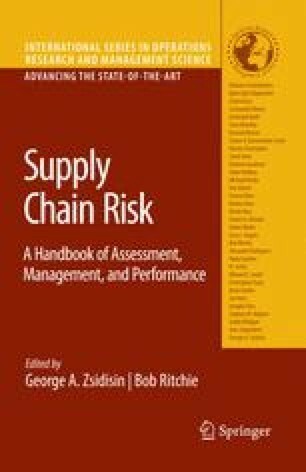 It is subsequently argued that it is necessary to integrate this method into the process model of Supply Risk Management to enable a sustainable and company-wide Risk Management approach. Anonymous 2006 Contintental Jahresbericht. See http://report.conti-online.com/de/02_unternehmensprofil/kapitel_2_11_de.html. Khan O, Burnes B and Christopher M 2007 Risk and supply chain management - creating a research agenda. Currently in review, see http://www.som.cranfield .ac.uk/som/research/ groups/scrf/Articles.asp.